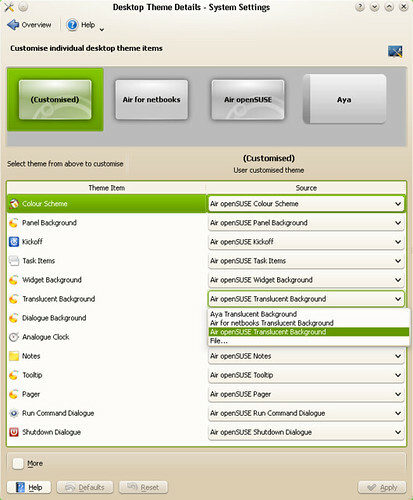 To customise individual components of the KDE desktop, click System Settings > Advanced tab > Desktop Theme Details. These days KDE 4.x gives you the same kind of fine grained control over the desktop that you had with 3.5.10, so that customizing the desktop and making your own theme is a snap. Here's mine, calling it "Clean Green" for now. KDE 4.5 will be released on August 4th and will likely hit the Factory repo's shortly thereafter. Have been using the rc for the past week or so, works fine, nice and stable, no issues so far. Can't say I'm keen on the white/colorless system tray icons though. very nice mix, pleasing to the eye. Not the least bit over powering or to bright. Package it and post to kdelook.org I'm sure others will agree. I realize that kde 4 is still being developed, but there are a lot less screen-savers than with 3.5, and with no opportunity to import from an external source. I particularly liked one of the 3.5 ones called "antinspect" and it would be nice to have it again (I always like to keep a little of the past !). The best thing of 11.3 (and kde 4.4) is having a search engine that works. it is lightning fast once everything has been indexed. Carrying on from the Krunner tips in the old forum, there is a lot more to Krunner than at first meets the eye, click on the wrench in the top left to see your Krunner settings and plugins. (I'm currently running KDE 4.5 rc3, release of 4.5 has been delayed until next week, no issues at all at the moment). Also, there are a lot more commands you can run from Krunner than you probably thought. Typing "file" for example will give you a scrollable menu of all the things you can do with files. There are a whole bunch of other commands some of which are extremely useful, here's a few, try some. Courtesy of TuxRadar. 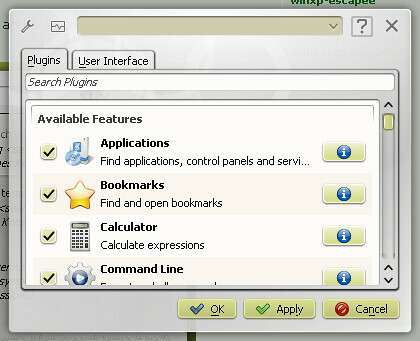 * applications Lists the shortcuts to the applications and folders shown in the KDE launcher menu. Makes KDE feel a little like Apple's OS X for application launching. * file The protocol used for switching back to file browsing. For example, file:/home opens your home directory. 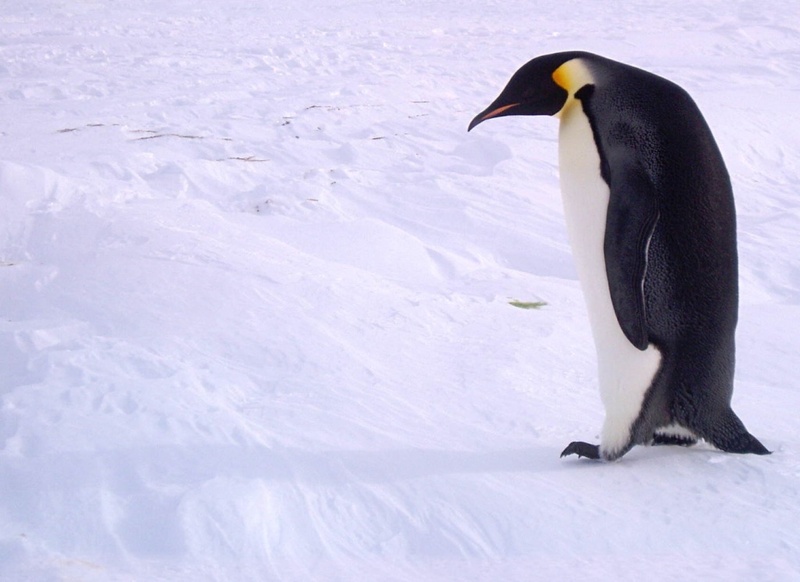 * fish Opens a user's home directory on a remote machine running an SSH server without any further configuration. * floppy Reads the content of a floppy disk and displays it in the current window. If you don't know what a floppy disk is, don't worry about it. * fonts Lists any personal and system fonts you've got installed. Enable 'Preview' from the View menu to see how the fonts look. * imap/s This is one of KDE's best features if you happen to use an IMAP mail server. Just type imap:// followed by the name of the server to access your email. * ldap/s LDAP is a directory access protocol that provides lots of useful information about people on your network. Browse the directory directly with this shortcut. * man The KDE equivalent to the man command. 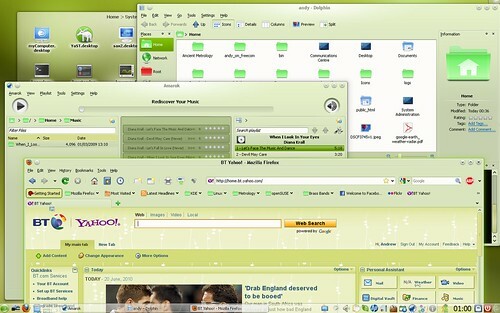 It displays the manual to many installed commands and apps. * mbox Lists the contents of the email held in your local inbox folder. * nfs Browses a Linux file server configured to use the NFS protocol. * nntp/s Uses ancient news servers to read forums and posts on thousands of different subjects. * pop3/s POP3 is probably still the most popular email protocol. Use this shortcut to list the emails held on your POP server. 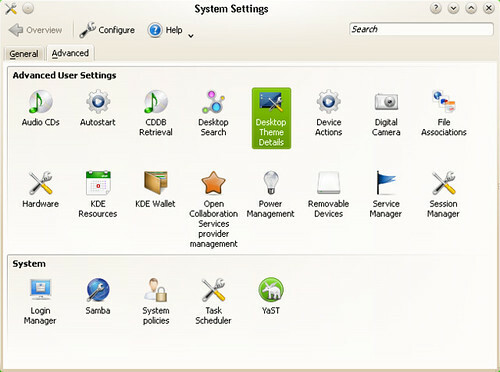 * programs Works in much the same way as the 'applications' shortcut, only with the addition of KDE's settings application. * remote Lists machines on the local network, through network services or Samba shares. * settings Lists KDE's various config panels. * sftp Accesses servers using SSH and the secure FTP protocol. Faster and more efficient than 'fish', but less flexible. * smb Browses Samba and Microsoft Windows shared folders on your local network. * trash Take a look at all the files and folders you've consigned to KDE's trashcan. * zeroconf Zeroconf is an easy way of browsing local network services such as SSH and FTP without knowing of their direct IP addresses. You might find that some of these work best if Konqueror is your default browser/file manager. Krunner is turning out to be one of the most useful KDE app's. Just Brilliant!